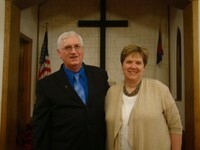 I'm Roger Emerson, Pastor of Ansonia United Methodist Church. Welcome to our Web Site. Please feel free to browse around and check out what we're all about here at AUMC. If you're looking for a church home, I want to invite you to worship with us on Sundays at 10:30 a.m.
Our web site gives you a glimpse of who we are but I want to encourage you to come and be our guest on Sunday morning and have a chance to experience the warmth, friendliness and authenic Spirit-filled fellowship of AUMC. Come casual, in jeans, or wear a tie - whatever you feel comfortable in. We're a multi-generational church with all ages and we love to sing praises to God together; share our joys and concerns together; laugh and cry together; hear the Word of the Lord proclaimed together; and just be real together. So if it's authenticity you're looking for with real people and real life, then maybe Ansonia United Methodist Church is just the place for you. I wish you all the best and may God richly bless you.